Staring at the glowing screen of a smartphone during a live comedy show is usually considered just plain rude. Not at WiFi Wars. 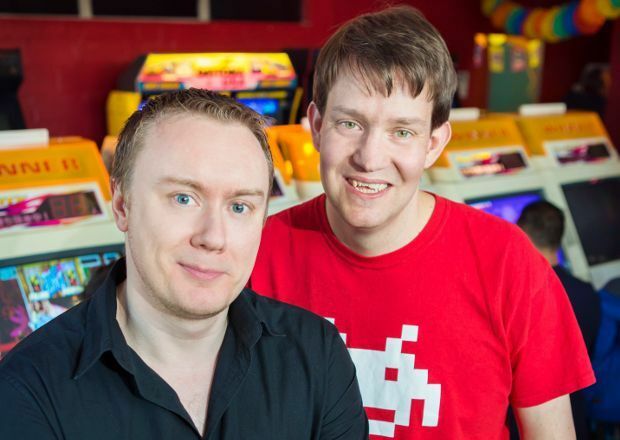 Steve McNeil and Rob Sedgebeer's live, interactive comedy video-gaming show not only encourages punters to whip out their mobiles, using them is integral to the show. Heck, it's the whole show. It might sound clichéd, but 'fun' is the most apt word for it. One minute the audience plays a giant version of Whack-a-Mole, the next they fly spaceships and (attempt to) avoid asteroids, and after that punters vote on which direction to take a penalty kick … The games range from 8-bit classics to 3D first-person shooters, and they're all mightily impressive. Remember the pure enjoyment of playing video games as a kid? Here, it's recreated on a massive scale. The two gaming fans met after one of McNeil's shows in Edinburgh with Sam Pamphilon. The double-act had started a more simplistic, chaotic version of WiFi Wars called Go 8 Bit, where comedians battled each other at retro video games. 'Rob came up to us and said, "I've invented this thing you might like to use in your show",' says McNeil. That 'thing' was an interactive version of one of the earliest arcade games, Pong, which involved each audience member voting as to whether their team's bat should move up or down to return the ball. The game became a regular in the Go 8 Bit shows, so Sedgebeer introduced them to another game he'd invented for the Oculus Rift virtual reality headset. Then the Royal Institution got wind of these tech inventions and things got serious. The pair are also in talks about adapting the show for broadcast. If that happens, it'll be the second TV show for McNeil. Go 8 Bit has a series on Dave later this year, hosted by Dara O Briain, and with lots of Sedgebeer's technology on show. WiFi Wars, Pleasance Dome, 12 & 13, 19 & 20 Aug, 11.20pm, £12.50 (£10). Steve McNeil hosts a comedy game show where the audience plays along on their smartphone or tablet.